Perhaps the most prescient scene in the futuristic 1960s cartoon “The Jetsons” was when George, the eager technophile, had to run as fast as he could to stay on a newfangled treadmill gone haywire. It’s an apt metaphor for some technology today, particularly in the real estate industry, which is quick to jump on the newest disruptive innovation, but often ends up with the next Bluetooth-enabled toaster instead. Is any of it really necessary? Maybe. There are real changes taking place that could have a lasting effect on housing — from land use and affordability to the fancy amenities that influence how and where we live. Some of the best tech, the kind with staying power, has been percolating for years, often after failing miserably at first. It persists because there are no perfect solutions to the problems it is attempting to solve, but there is always hope that someday someone might get it right. Among the innovations in the New York area currently worth taking seriously: modular housing that can be built faster and cheaper than traditional construction; robotic parking systems that move cars safely and efficiently; signal-boosting devices that allow cellphone reception in high-rise towers; and luxury amenities like infrared saunas. The solution, he said, is off-site construction, in which factory-made steel modules — outfitted with electrical and plumbing systems, high-end finishes and even elaborate facades — can be stacked on site, like Legos, in about 70 percent of the time it would take for conventional builders to complete a high-rise tower, and with considerably less waste. Plus, since the manufacturing is done indoors, weather delays and safety concerns are reduced. Part of the technology’s appeal is that it is less reliant on highly skilled workers. Using technology from the aerospace industry, a robotic camera in Full Stack’s 85,000-square-foot factory in the Brooklyn Navy Yard can measure within 2-thousandths of an inch, while most contractors might settle for a 2-inch margin. During on-site assembly, the company deploys a drone camera that uses photogrammetry, a series of precise surveying-image measurements, to ensure the modules are correctly stacked. 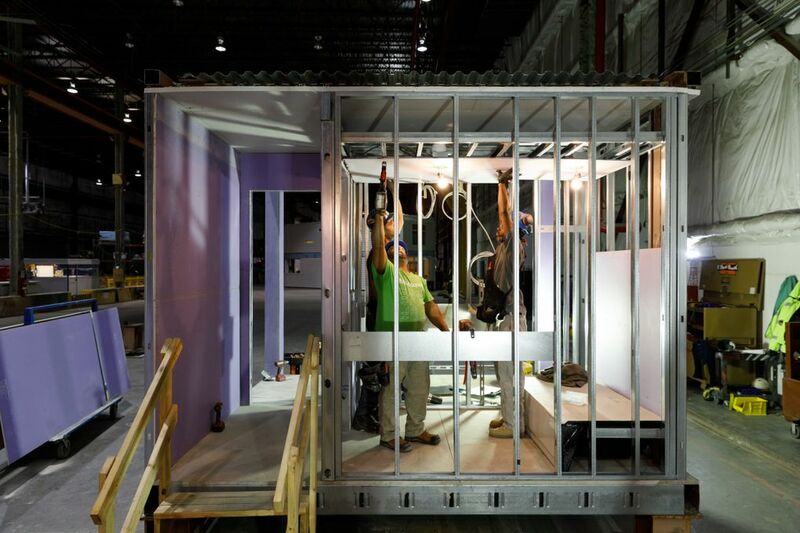 The modular method has gained a foothold in hotel construction, as well as low-rise and single-family projects. Krulak estimated that there are about 30 modular buildings in New York, including Carmel Place, a 55-unit micro-apartment building in Kips Bay, completed in 2016. Of course, there have been blunders along the way. 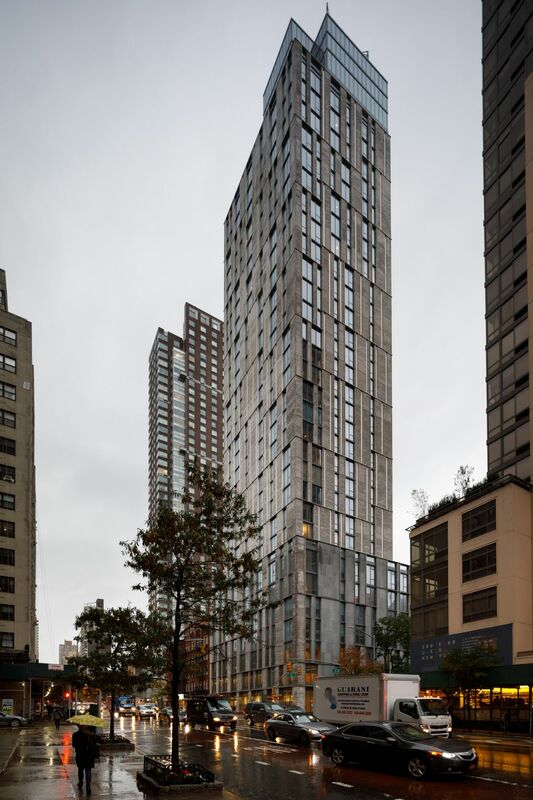 The 32-story rental tower at 461 Dean St., in the Pacific Park complex in Brooklyn, completed in 2016 and now fully leased, was supposed to be a paragon of high-rise modular design. Instead, the project dragged on for four years amid technical snafus and a dispute between the developer, Forest City Ratner, and its partner, Skanska, which ran the modular operation. Thanks, in part, to the delays and high costs, Forest City sold the 363-unit building and left the modular business. “It was a mess,” said Alicia Glen, deputy mayor for housing and economic development, adding that the tower was too big and complex for a prefab construction project. Krulak, who also worked on it, admitted there were miscues in the process. But the city remains interested in modular construction and hopes to use it for affordable housing. The department of Housing Preservation and Development is expected to announce a deal with a subsidiary of Radson Development to build an 80-unit, 10-story modular rental tower in Far Rockaway, Queens, where all of the units will be reserved for those making no more than 70 percent of the area’s median income, or $65,730 a year for a family of three. “Part of what we’re doing, in some way, is to correct the narrative” about modular construction, Glen said. 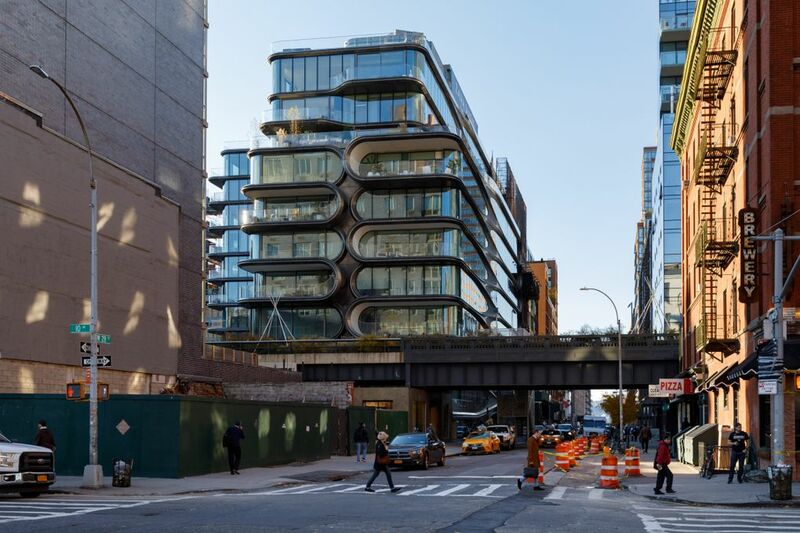 The project, on Beach 20th Street, will go up around the same time as a similar, conventionally built mid-rise on the same street by the same developer. The company hopes to finish the modular tower 30 percent faster, for only slightly more than the cost of a normal build, Glen said, although she didn’t disclose the budget. The architect is Magnusson Architecture and Planning, and Full Stack will manufacture the modules. 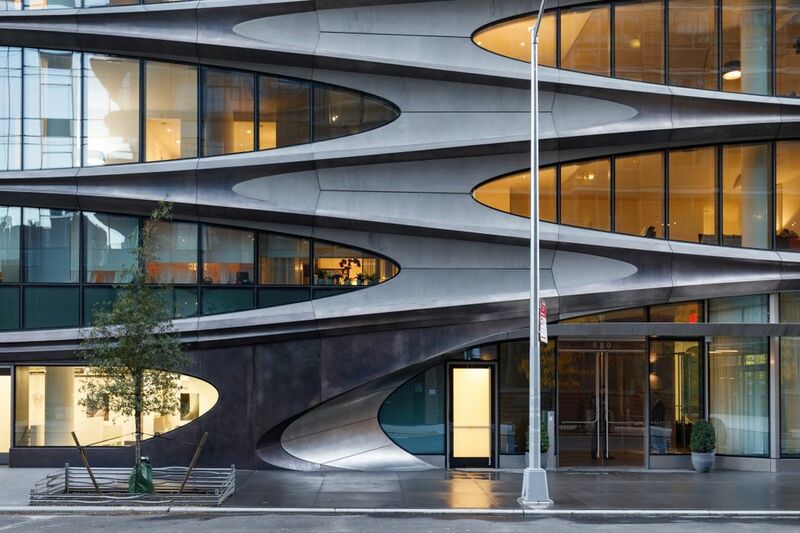 SHoP Architects, the award-winning firm that designed 461 Dean, has plans for another project. 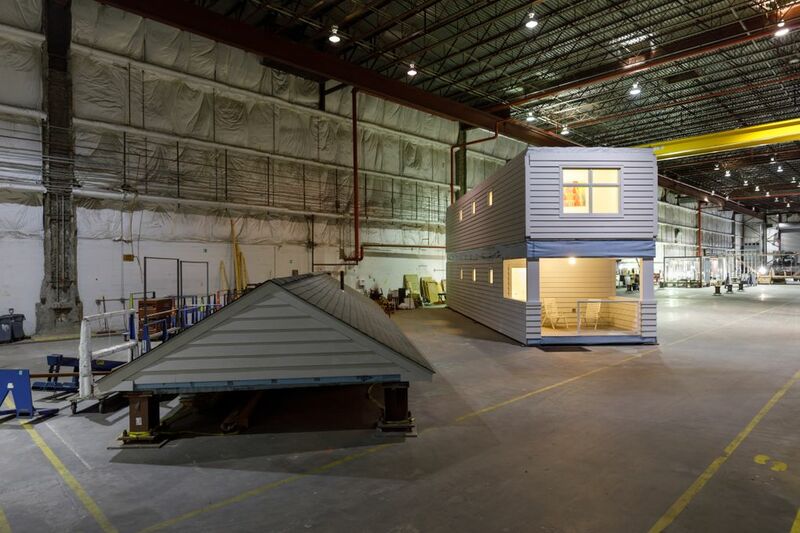 The architects have partnered with the venture capital firm Tectonic Capital to fund an as-yet unnamed company to navigate the entire modular process — from design and manufacture to on-site assembly — and plan to bring the building to market in 2019. “The assembly will take days, not weeks,” said Chris Sharples, one of the architects, adding that the proprietary software will allow a number of regional suppliers to collaborate in a process more akin to manufacturing Boeing airliners than building with bricks and mortar. One recent afternoon, Yair Goldberg, an executive with the automated parking company U-Tron, pointed to the outdoor pool at Park + Garden, a 212-unit luxury rental tower in Hoboken, New Jersey. Then he pointed to the rooftop park and the lounge, amenities that might have been smaller, or not built at all, he said, if the developer, Bijou Properties, had opted for a traditional ramp parking lot. Original plans for the project called for a 10-story parking garage with more than 300 spaces. 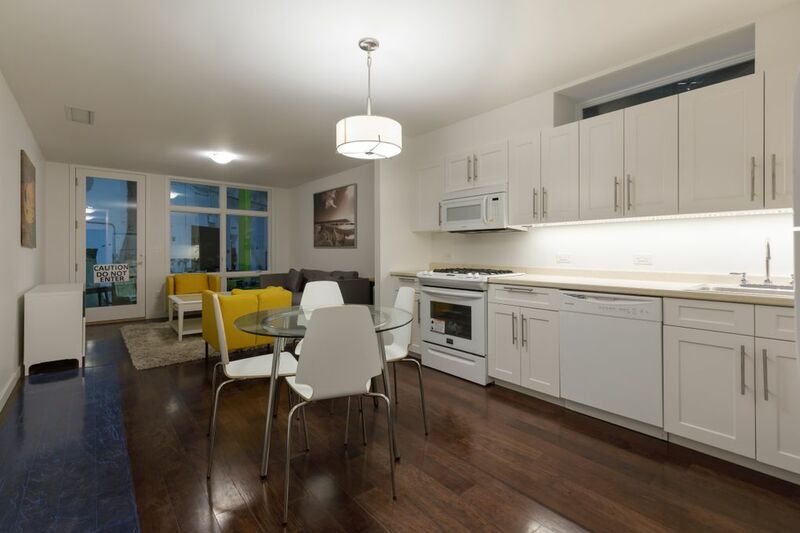 U-Tron’s design achieved the same goal in a four-story space, allowing the developer to add more than 30 units to the building and dedicate more room to amenities. “You’re benefiting the developer, who’s getting a much better land use, but you’re also benefiting tenants,” Goldberg said. The U-Tron system is essentially a vending machine on a giant scale, with a computerized brain. It uses big turntables, robotic arms and a network of checks and balances to ensure that cars get from point A to point B unscathed. 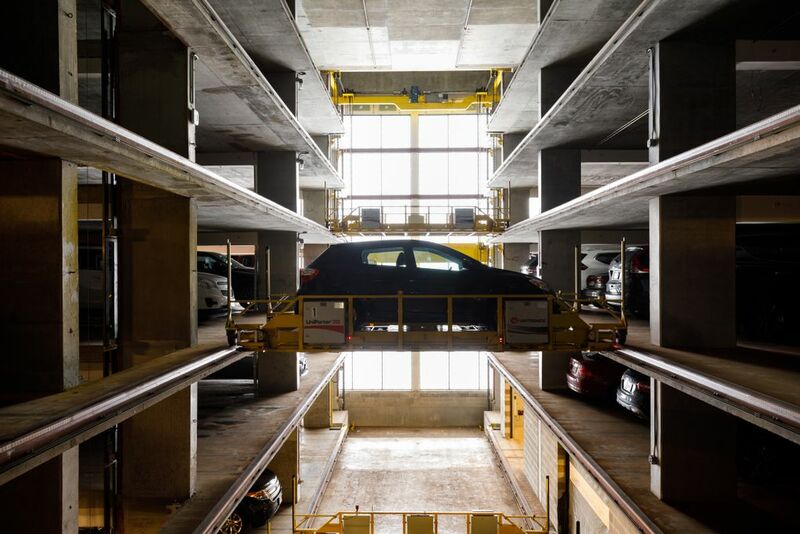 The U-Tron system can pack cars 4 inches apart, with 6 inches of overhead clearance, resulting in two or three times the density of a normal garage. And aside from upkeep, there is no human intervention, which means the builder saves on labor, ventilation and lighting costs. With the use of an app, a driver can summon a parked car and retrieve it from a loading bay in an average of five minutes. That is, when everything goes according to plan. 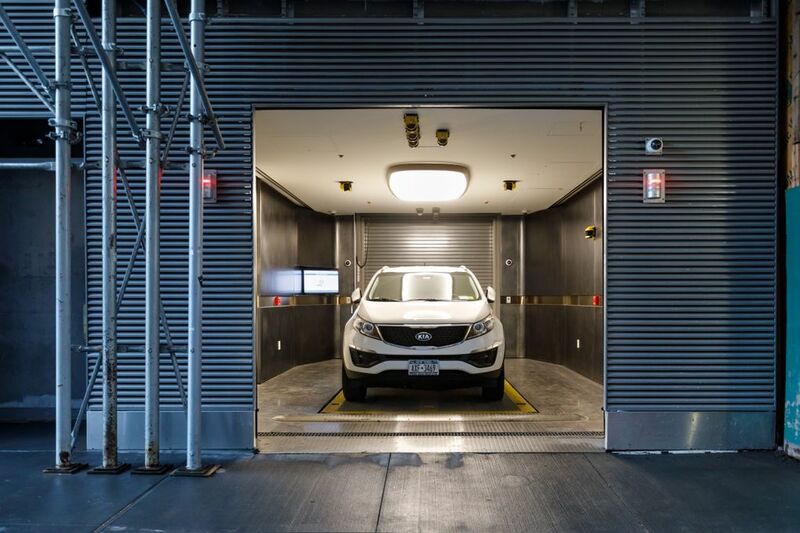 The robotic parking industry was poised to take off in the early 2000s when the real estate market was booming and positive reviews from overseas markets spread. Then the recession happened, and the systems — which can cost about $30,000 to $40,000 a space, or nearly twice as much as conventional parking — fell out of favor. There were also publicized failures. In 2004, at a Hoboken, New Jersey, automated garage recognized as the first in the country, a Cadillac DeVille fell off its pallet and crashed six stories below. The following year, a Jeep Wrangler in the same garage plummeted four stories. In 2015, residents of a luxury condo in South Florida were caught in a legal dispute between the developer and a now-defunct parking provider whose system sometimes left residents waiting hours for their cars to be retrieved. Builders today “are just afraid — they’ve heard the horror stories,” said Jerry Marcus, owner of the Parking Advisory Group, a consultancy that works with developers and architects. But there are signs that the technology may finally be gaining traction. 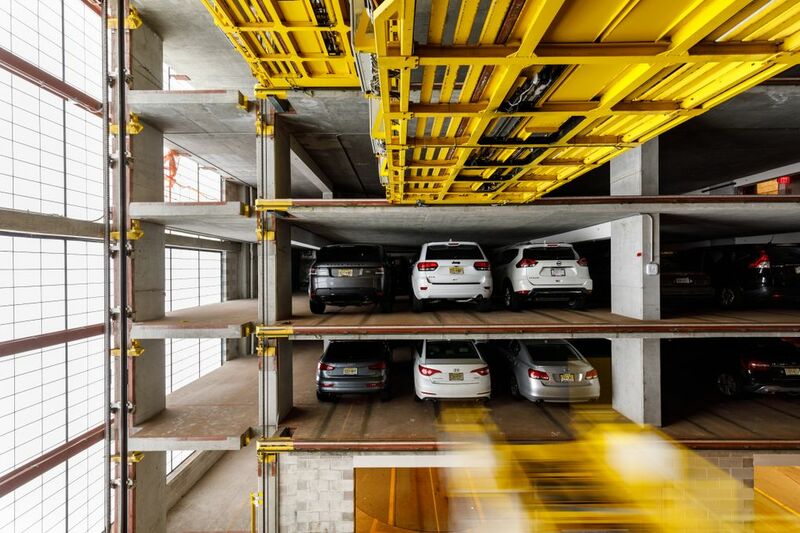 “There are going to be more built in the next two to three years than there have been in the last 15,” said Ian Todd, director of automated parking systems for Westfalia Technologies, in York, Pennsylvania. His company has completed two robotic lots in the United States, and is in talks to do 25 more, mostly in the Northeast, but also in Austin, Texas, and the San Francisco Bay Area. The technology has improved, Goldberg said. U-Tron, for instance, takes 3D photographs of a car’s dimensions to ensure that it is given adequate space. The system also does a kind of housekeeping, in which it learns the habits of users and can shuffle cars to more convenient spots for removal, to keep drivers from growing impatient in the loading area. “We put an emphasis on the psychology of waiting,” he said. Jersey City Urby, a 69-story luxury rental tower across the river from Manhattan, is a certified green building, with high-tech features like keyless apartment entry with the use of a smartphone app. But the developers didn’t anticipate that the building’s energy-efficient windows and walls would create cellphone dead zones and interfere with their fancy app. That was especially true on the top floors — that is, the prime real estate — where two-bedrooms were priced at $5,500 a month. For about $400,000, Illuminati installed a passive distributed antenna system, a network of antennas, cables and signal boosters that amplified the signal from the air, without the costly infrastructure of hard-wiring the building to each of the major service providers. “Cellphone connectivity is really looked at as a utility,” said Jeffrey Gudewicz, chief product officer at Wilson Electronics, the company whose devices were installed at Urby. “It used to be that you’d negotiate, pre-construction, with the cellular providers,” said David Barry, president of Ironstate, one of the developers. But in the past several years cellular companies have increased the price of installing the wiring that ensures a strong signal in a building, Barry said, and it would have cost $2 million and taken more than a year to install at Urby. Whereas the Wilson system, he said, is carrier-agnostic and can be installed in weeks, not months. 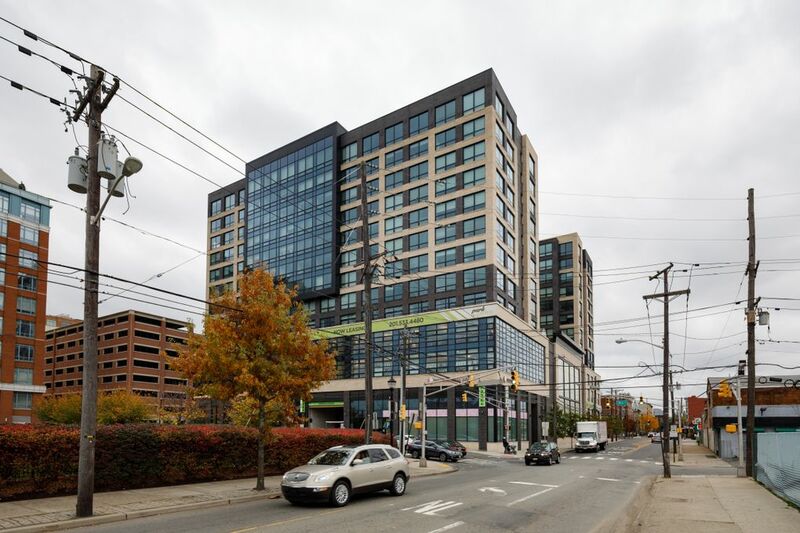 Now the 762-unit building, which opened in 2017, is fully leased. Others are also recognizing connectivity as an amenity. Related Cos. has partnered with Starry, a Boston-based company that provides what is known as 5G fixed wireless internet service, for a flat fee of $50 a month to those who live in residential towers, with no additional rental costs or unwanted bundles. “Nobody actually knows what 5G is,” said Virginia Lam Abrams, an executive with Starry, because it represents the next generation of low-latency, high-capacity access networks with smoother performance. In Starry’s case, that means 200 megabits a second for downloads and uploads, up to a gigabit a second, with no usage caps, she said, adding that larger companies might charge double that for lower speeds or require a bundled package with cable. “There are still going to be folks who want their NY1 and their bundled content, but there’s a real desire from the younger generation,” said Joanna Rose, an executive vice president with Related, who said the service will be rolled out to all of the developer’s New York buildings, with a reduced-cost subscription in the affordable projects. 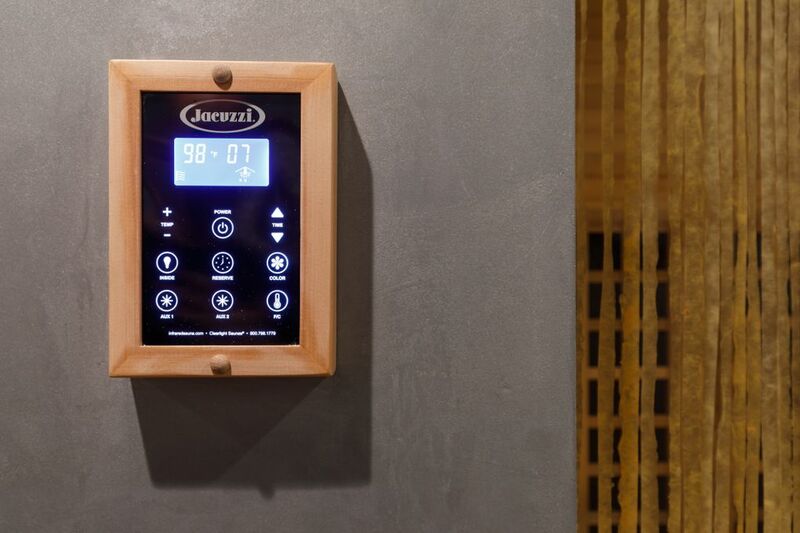 Clodagh, an interior designer known for her holistic philosophy, is a big fan of a recent addition to the New York spa: the infrared sauna. “Gwyneth Paltrow, madam Goop, is very hot on it, as it were,” she said, referring to the actor’s lifestyle brand. 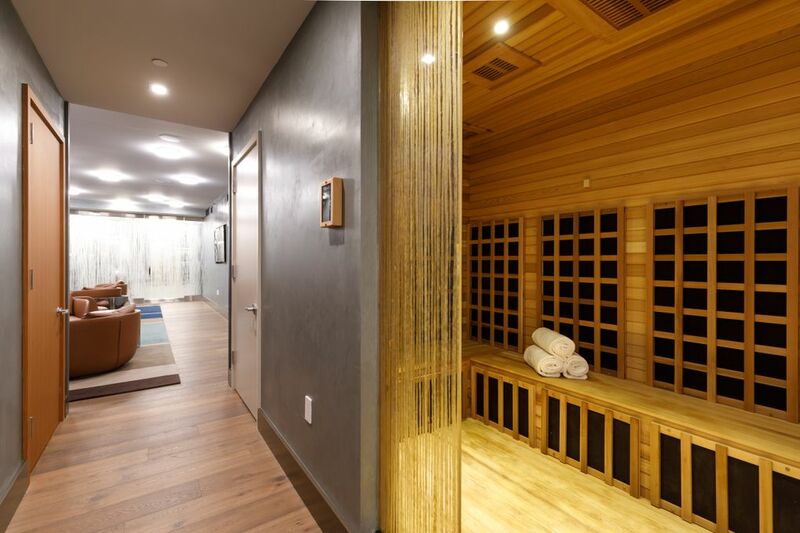 When Clodagh designed the interiors at Citizen360, an Upper East Side condo, she included a 6-by-10-foot infrared spa made of cedar instead of a conventional spa that uses heated rocks and can raise the temperature to 200 degrees. In an infrared spa, light waves heat the body rather than the air, which works faster and keeps the room temperature between 110 and 160 degrees. Some of its health claims are unproven, but there is evidence that the treatment can be beneficial for people who have joint pain or are ill suited for hotter traditional saunas. Also, it requires less maintenance than a steam room. “It’s been very well received,” said Beth Fisher, a senior managing director at Corcoran Sunshine Marketing Group, which is marketing the building. Wellness is the theme at other new developments, too. At Waterline Square, a three-tower complex rising on the West Side of Manhattan, the buildings will share a below-grade, roughly 100,000-square-foot area with a saltwater swimming pool, an indoor tennis court, a skate park and other amenities, said Elisa Orlanski Ours, chief planning and design officer at Corcoran Sunshine. 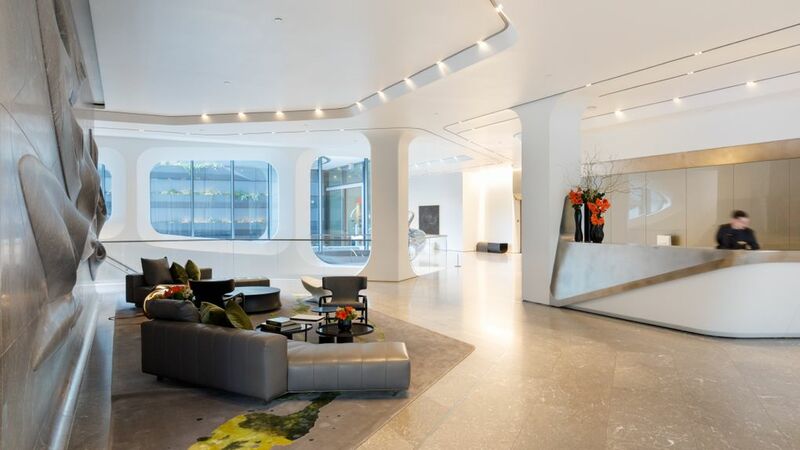 But because the space is subterranean, the developer hired Focus Lighting to install a diurnal LED system that will change throughout the day to mimic the quality of natural light. “We didn’t want it to feel like a Vegas casino,” said Stephanie Daigle, a senior designer with Focus Lighting. The three-story space will have more than 1,000 linear feet of lighting that will mix various tones and colors to create an inviting space. Elsewhere, amenities are embracing a space-age look. 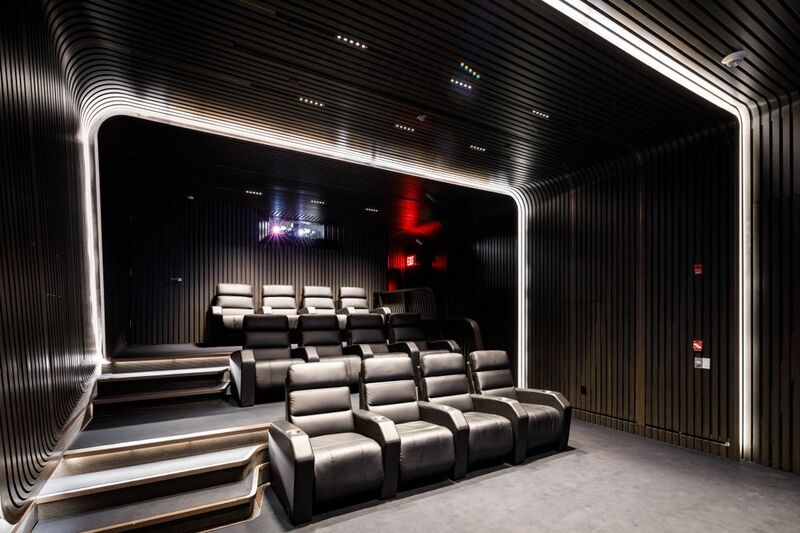 At 520 W. 28th St., the futuristic condo designed by Zaha Hadid, there is an equally futuristic-looking IMAX theater — the first in a residential setting in New York. 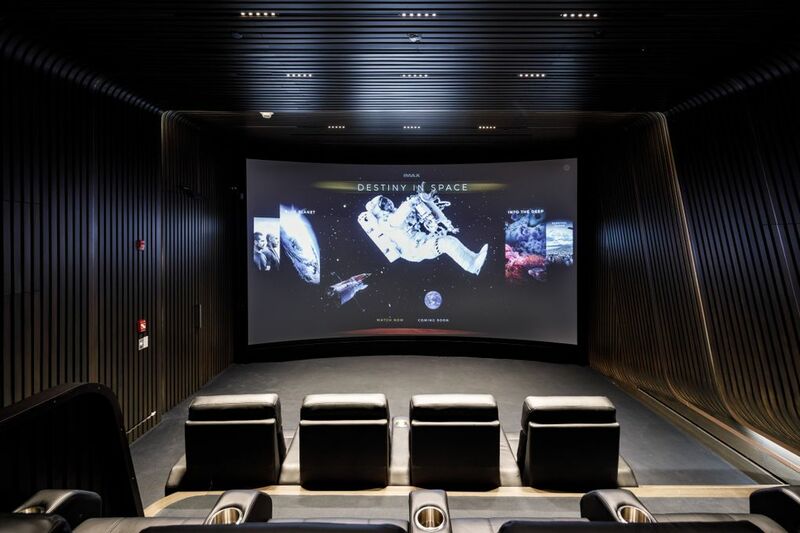 The 10-by-18-foot screen is flanked by a surround-sound system built into custom millwork that evokes the feeling of an alien spacecraft. The 12 fully reclining seats are on platforms that can retract into the wall to create a more open, social space. Not including the price of the technical equipment, the room cost well over $1 million to build. It’s all in service of attracting an upscale clientele. (Naturally, the building also has robotic parking and storage.) So far, half of the 39 units have sold, but the $50 million triplex penthouse is still on the market. Gregory H. Gushée, an executive vice president with Related, the developer, said the company has a special client in mind. In the penthouse library, there is a shelf of carefully chosen books: biographies of Albert Einstein and Benjamin Franklin, “The Lord of the Rings,” a treatise on super intelligence — all purported favorites of Tesla co-founder Elon Musk. “We’re still working on the Elon staging,” he said.